These are called french toast puffs and they’re the most delicious version of french toast ever! A crispy and crunchy outside with a soft, almost doughy like, puff inside. Seriously amazing! See below the pics for the recipe. 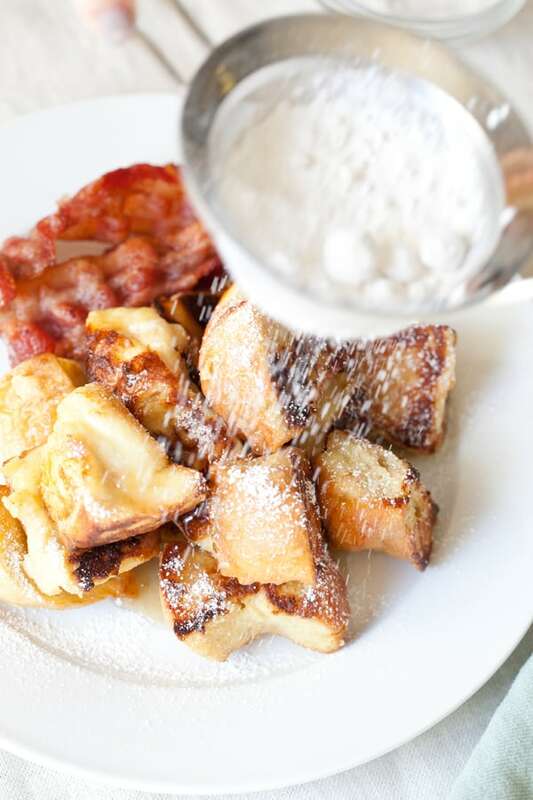 I’ve been contemplating starting a “Sweet Mornings” Monday breakfast series on Sugar and Charm, featuring some really tasty breakfast recipes. Maybe it could be bi-monthly. I’m a big fan of brunch and sometimes I even eat breakfast for dinner, ha! I think it’s safe to say that it’s my favorite meal of the day. I also want to experiment with recipes because I need to build up a good list of weekend breakfast options for when my little boy can eat! What do you all think? 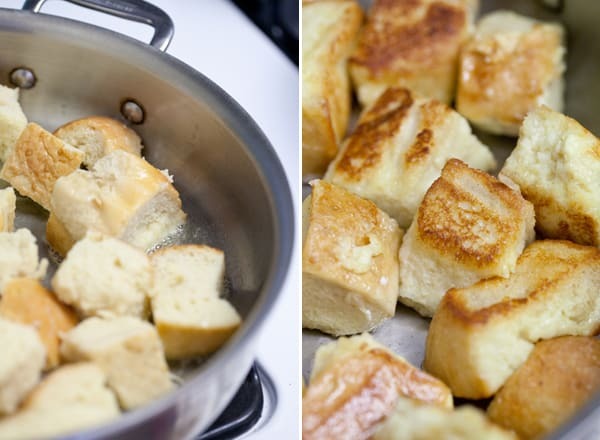 Cut the french bread roll into 1-2″ cubes. In a large bowl, whisk together the eggs, milk and vanilla paste. 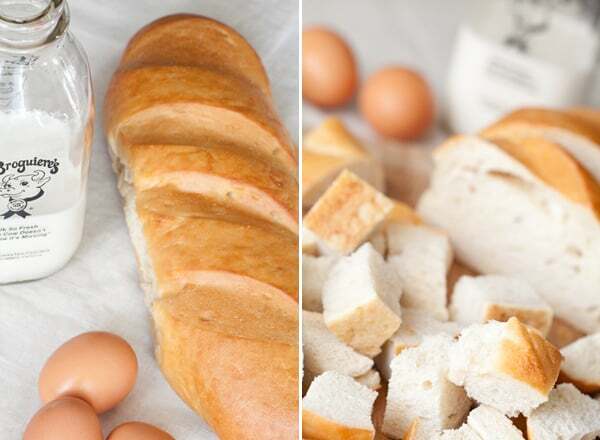 Add the bread cubes into the bowl with the egg mixture and move them around until they’ve all been coated. Let them soak for a few minutes. In the meantime, heat the oil and butter in a frying pan. When the oil is hot, place the cubes in the pan. Turn them often so they don’t burn on one side. Once they become a dark golden brown, remove them. Add butter, syrup and powdered sugar to the top. Enjoy! looks delicious! the puffs make it shareable and would be sweet for a brunch party! It’s perfect for a large group!! I’ve made it several times Christmas morning and it’s always so yummy and such a hit!! 🙂 Thank you for all of the sweet comments! Oh man, these look amazing! Can’t wait to try them! Love that they are bite-sized. So easy to handle, and so pretty. 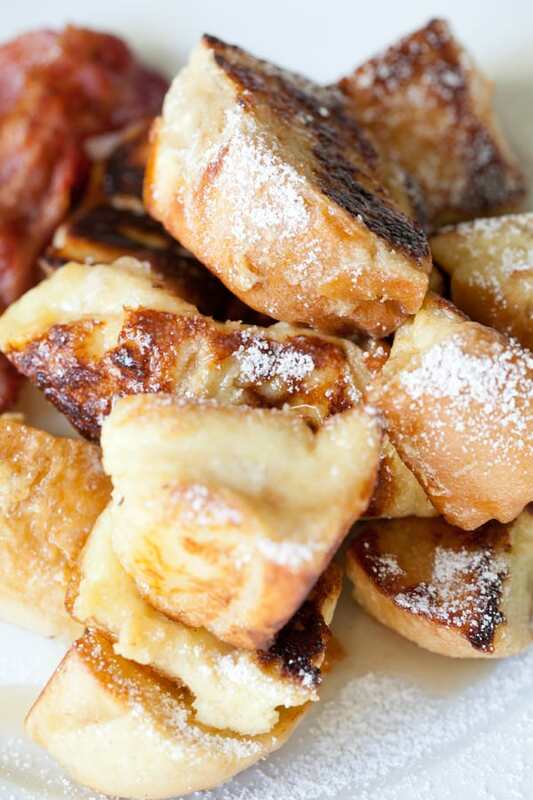 I love any variation of French toast. I make Paula Deen’s French toast casserole every year for Christmas morning. I can’t make it any other time, or I’ll eat it all. So amazingly good. This looks awesome because I could do smaller batches. These are definitely going to be on the menu next weekend! I love all your recipes! I think it’s called French Toast because it uses french bread? I don’t know, haha!! Yum! I love the idea of a Sweet Mornings series. I’m always on the lookout for new twists on traditional breakfast fare. You know I’m French & I never ate that ! But that looks yummy ! Hahah!! Yeah, I don’t think it’s very popular in France! But, we use what we call french bread to make it! It’s really yummy!!! Wow!! I’m already hungry, it looks so yummy! Looks amazing, I can’t wait to try them. Bring on the brunch recipes…I’m a huge fan! Can vanilla extract be substituted for the vanilla bean paste? I’m not sure where to find that. Yes! I just like vanilla bean paste because it has a rich vanilla flavor, but vanilla extract is good too! These look to die for! My kids will go nuts for these! what is vanilla bean paste and where do I find it at the grocery store, in what isle? what is vanilla bean paste and where do I find it in the supermarket,in what isle?